Home Storage? Back-up? Instant File Sync? Synology! One of the most important components of my home data center, are my Network Attached Storage (NAS) servers. I have had my old NetGear ReadyNAS unit for at least 9 or 10 years now. 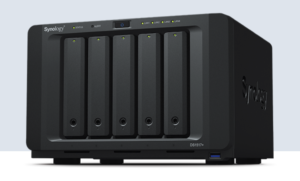 It has a whopping 1.3TB of storage across 3 drives in a RAID 5 configuration. NAS units are great for storing my racing videos that no one will ever watch, old photos now that everyone with a phone collects thousands of photos a year, and copies of my important tax, mortgage, and legal documents. Some of my friends store TBs of pirated videos from the dark web. I am a NetFlix and AppleTV guy so that saves me a few TBs. While the ReadyNAS served me well, it was long in the tooth and short on TBs. It also was missing some of the interesting new features that I did not even know I was living without until I bought my first Synology NAS back in 2015- the DS1515+. These guys really have done the whole consumer NAS thing really well. The main feature I use and like is the immediate file sync of Linux directories on my Linux servers (and one of my Windows 10 desktops as well). Once I configured this option and selected the directories I wanted synced, all of those files continue to be safely stored on the NAS. No backups – it copies the files immediately upon edit or save to the NAS file system. It is also a nice way to grab files from one machine to the other as the systems can all see the disk replicas across the servers. This does not mean I do not do backups. I have Amazon Glacier storage and I have those critical legal, tax, mortgage files sent out to Glacier storage once a week from the Synology NAS. The great thing about that is Synology provides the service that runs on the NAS to do the Glacier backup. Really simple integration. The disk drives are even “hot swappable“. No downtime if you have a drive go bad. Aside from rock solid hardware technology, another amazing thing about Synology is the application ecosystem they provide on the NAS server. They want you to make this your “server” for everything and anything you do in your home. Want a VPN sever? It has that. DNS? Yep. Connect with my Macs, Windows, and Linux in their native network protocols? Of course. It has email servers, video security servers (I bought two cameras to test and they are great), video, photo, audio servers. There are Active Directory, Email, Network Management, Print, Content Management, WordPress, WikiMedia, E-Commerce, Docker, Git, Web, Plex, Application (Tomcat) and Database servers! These all run Native on the NAS. Not just as the disk – but in the memory and on the quad core CPU. I cannot possibly list all of the features and servers these new Synology NAS units supply. I have tested many of them, and they are rock solid and dependable. I never envisioned using my NAS as a “server” other than as a network attached storage server. Now it can work as so much more. The Synology product has me so hooked, I bought my second unit! A DS1517+ with 8GM of main memory and 30TB of storage (5 disks @ 6TB each). I used this for the security video storage and as a snap backup of the first unit. Had I planned it better, I could have arranged these two Synology units in an active-passive mirrored configuration. This would allow one to take over if the other crashed. Clearly I do not need that at home. But it is nice to know that a simple consumer grade products offer these features now. These really are a great compliment to my home data center’s NUC-based Linux servers. But I do not use the NAS for Cassandra or Hadoop storage. That all lives on the SSD drives in each of the NUC units for performance reasons. I back them up to the NAS off hours. I fully and highly recommend these Synology NAS products. They do not sell direct. I recommend finding them on Amazon after you spend hours like I did on their product site comparing models and features. [Update] One cool thing I forgot to mention before I hit “publish”, is that this unit of course runs Linux. It is a 3.10 kernel version modified by Synology. This is the reason so many of these services (servers) are available as a stock part of the unit. Synology chose to make Linux the engine to run the NAS and brought along many of the Linux services. With simple configuration, you can ‘ssh’ into the NAS and work on it as though it were a plain old Linux box. It is really well done.